I'm a little partial to the warm natural tone and texture of cork and enjoyed having the opportunity to play around a bit with it when creating the Inspiration Board in my book, Creative Bloom. So as not to waste a whole corkboard with my experimentation I purchased a roll of cork contact paper. What I learned was that painting directly on cork with acrylic worked great but so did stamping. However if I completely covered the cork with paint I lost the warm cork color I liked so much. I ended up keeping the cork background visible by cutting my own stamp and stamping with acrylics while also creating some little accent stickers out of the cork contact paper. Cork on cork is pretty cute but cork in the shapes of butterflies was SUPER cute. 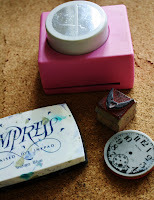 Now, a couple of years after my initial experimentation I'm starting to see cork embellishments come out in the scrapbooking stores so I thought I'd show you how really really easy (and inexpensive) these are to make at home. Step One: Choose some stamps and stamp directly on your cork surface. If you're using a detailed stamp (such as a photo realistic stamp) you'll want to make sure you really ink up the surface of the stamp. Then press the stamp firmly into the cork. Work on a hard surface for the best impression. If you plan on using a punch to cut out your stamp you might want to make sure you're working right at the edge of your cork as many punches won't allow you to reach very far. Step Two: Cut around the stamp either with a punch or a scissor. Using a sharp scissor will give you the crispest edge, cork can be difficult to cut with a dull scissor. It just wants to bend. If punching you might want to insert the image upside down with the punch flipped over so that you can position it perfectly. Step Three: Store your stickers flat as cork does want to break if rolled or folded. To use, simply peel off the backing paper and adhere to your surface. Easy as Pie. :) For the embellishment at right I did add a little twisted wire to the cork image with just a couple of stitches (more detail on this in my book, Creative Bloom). Enjoy!!!! * You can buy cork on a roll at craft or hobby stores but it usually does not have the adhesive backing. I did find that cork sticks just fine if using a UHU glue stick (apply for complete coverage) or tacky glue.